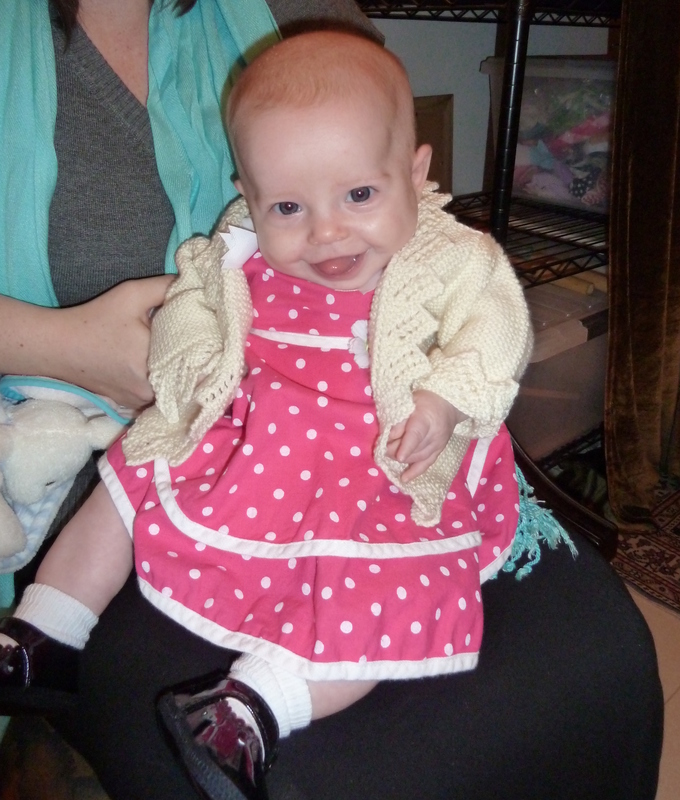 We have been to our first kid birthday parties this month (all the cool people are born in September, don’tcha know? ), and I’ve learned a few lessons regarding hosting and attending them. 1. Don’t take two kids if you are a solo parent and one of them really needs a nap. No matter how optimistic you are, that’s not going to go well. 2. 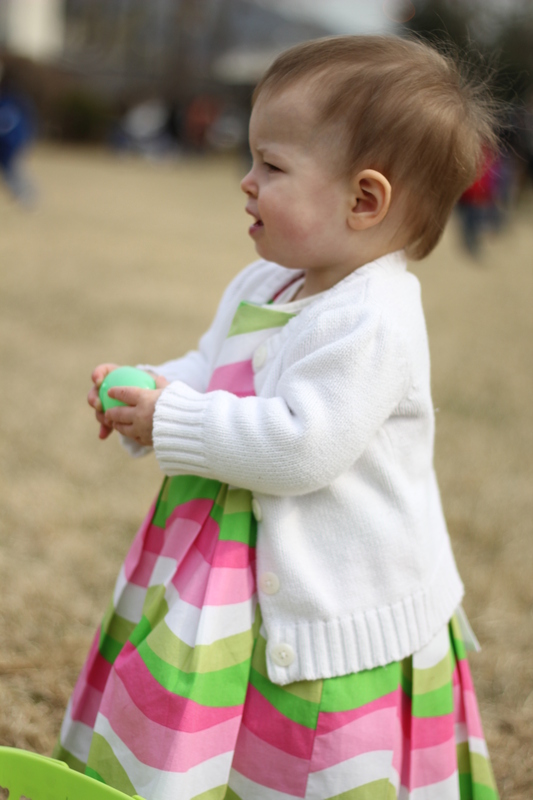 Even if they are both reasonably well rested, or one is willing to sleep on the fly, chasing the second kid will consume your entire attention at the party, don’t hope to eat or talk to anyone over the age of 3. If you do decide to talk to someone else, know that your kid will choose that moment to become the food thief, drink thief (particularly alcohol or soda), and general mayhem causer. Neko opted for the lick the frosting off everyone else’s cake or cookie approach, with a few incidents of juice theft and covert tea smuggling. 3. If you hold a kid party in your home, every room you have open to the party will be littered with food and greasy fingerprints. Your toilet may or may not have napkins in it. 4. Cake brings out the mean in all kids. Neko got pushed and yelled at more than she ever has before at these parties, for fear of cake theft. She’s not innocent, but most of those occasions occurred without provocation, and all children were getting hit or yelled at by the guardians of the precious treat. 5. Even at a party for babies, breastfeeding in public is not cool. Or it is. Depends on the crowd. Hard to gauge. 6. If you think you should invite a huge crowd because you expect few of them to show, they will all show. 7. Pinterest is a crazy seducer, but all your hard work will be destroyed in seconds by the toddlers, so opt for the pre made stuff instead, your heart won’t get broken when the flannel banner or the elegant lace cupcake display does. P.s. don’t tell Neko, but I let Panda play with her baby doll while she was napping. I am surprised by how much Panda is enjoying it. 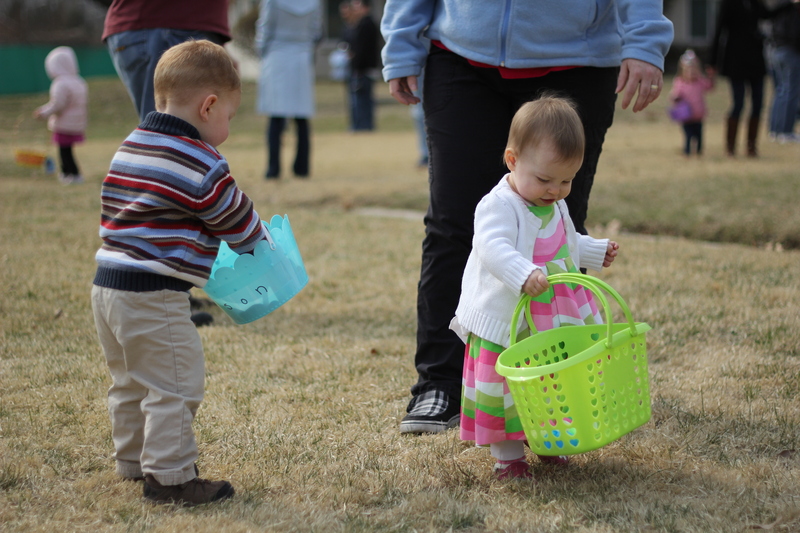 This generous little boy gave Neko half of his eggs. She gave some back, but kept a good number. I tried to create an online playlist, but the copyright regulators prevent me from doing that outside the US, so instead… youtube! I was listening to “Home” by Edward Sharpe and the Magnetic Zeros the other day, and thought it was a pretty awesome song to describe family life in the Foreign Service. Looking through my music directory, there are lots of songs that seem to speak to me as an expat. I thought I’d share them with you, but asked the FS blogger community if they had any input first. Strangely, they picked many of my favorites too. I’ll give each of them credit below. I’ll totally add in your suggestions if you have some that aren’t yet on the list. Leave them in the comments. Songs about family, when you’re far from family, or you’re family is living in 2 or more places, like on an unaccompanied tour. Songs about travel, experiencing new places and leaving others behind. Stephanie at Where in the World Am I? Nicole at Where in the World at Luca and Juliana? After posting on my favorite Dhaka-related “likes” on Facebook, I remembered one category of essential Facebook-ness for the expat crowd: expat groups. 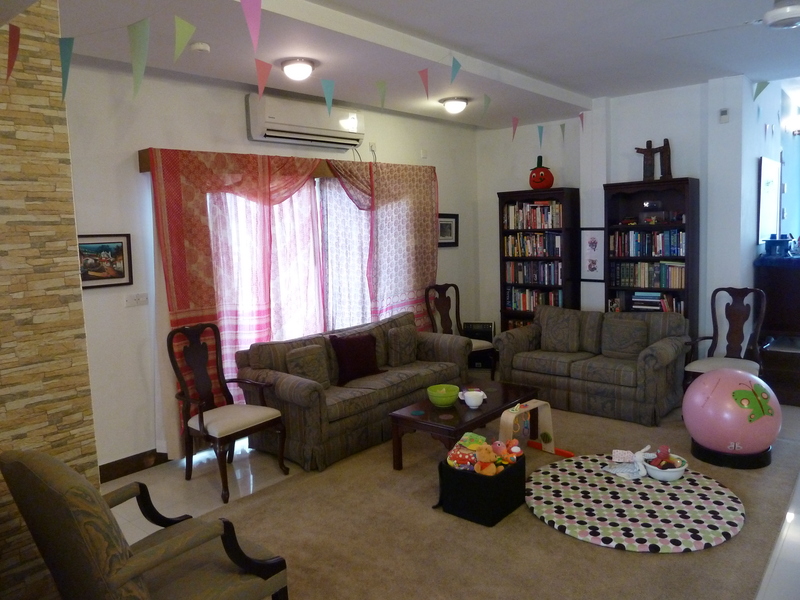 Deshperate in Dhaka is a meeting place for all expats in Dhaka. It’s got announcements about upcoming cultural, social and shopping events, as well as ads for used and new items and household staff. You can find the yoga studio or the spanish puppet show in Baridhara, from conversations on this page. Dhaka Daily, like Deshperate, has information about events and second-hand items. It’s nearly all Americans and Canadians, however, and focuses on the things most important to that crowd. I’ve seen people set up meet-ups for game nights, craft groups or BBQs on Dhaka Daily. Dhaka’s Moonshine Baby Group is where expat (mostly) parents come together to talk about Baby and young child things in Dhaka. If you’re wondering about a particular pre-school, looking for a playgroup, a doctor, or child-friendly hairstylist, this is the venue to ask those questions. There are also frequent ads for ayahs and used baby gear. We’ve purchased several things that were advertised here, because there are few places in Dhaka where you can find baby items at a reasonable price. 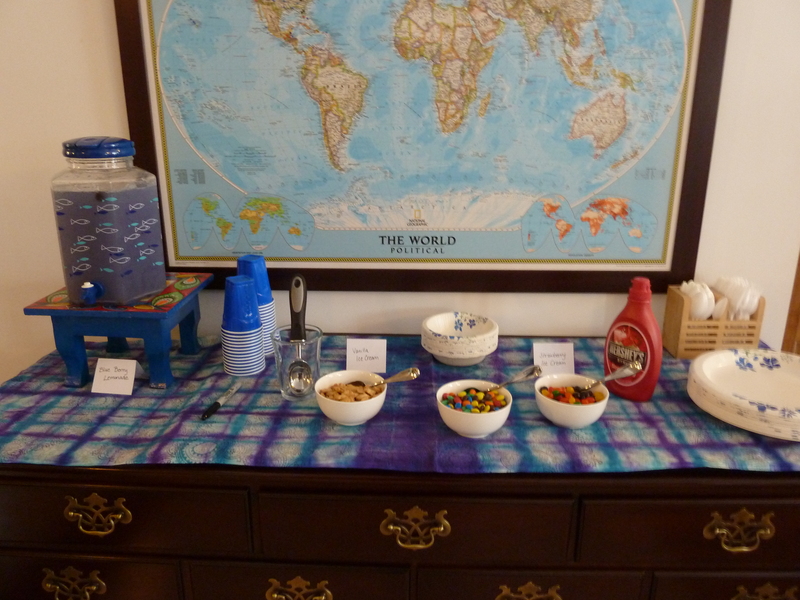 A few weeks ago, we hosted a baby shower for our neighbors, who are having their first child. When the invitations went out, they had been told the child was a girl, but the day before, the news changed, so it was good that we’d made at least a few of the decorations gender neutral! It was hard to find anything baby themed here in Dhaka, because it’s not part of the culture to celebrate a baby before it actually arrives. It was hard to even find party supplies that were for adults, however, rather than kids birthdays. If you want a Ben-10 themed party, or Doremon, or Dora, you’re set. DIT 1 has everything you could ever want and more. At Lavender market, they even have balloons in odd animal shapes, but no normal ones. So, I had to make some, and use things that aren’t typically party supplies. I made a banner from the only 3 colors of tag board/poster paper I found in all of the markets I searched. 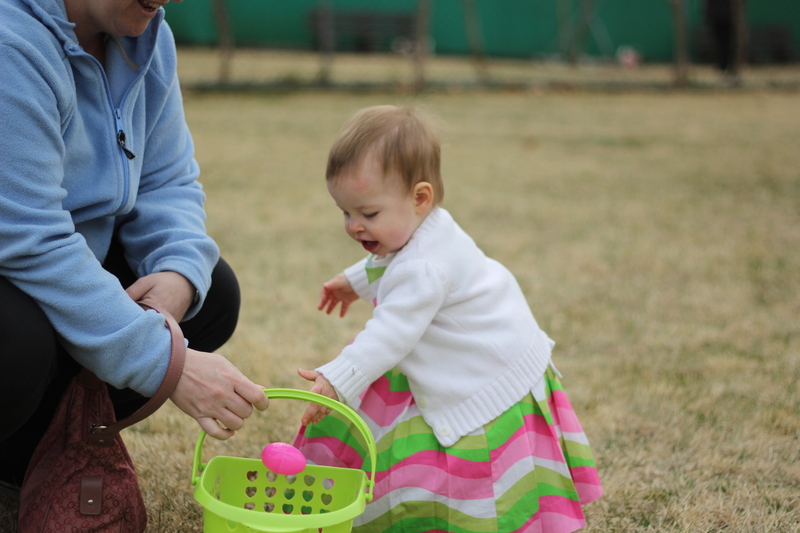 Luckily, those colors were pastel green, blue and pink. I used some of my weaving warp as the banner’s string. 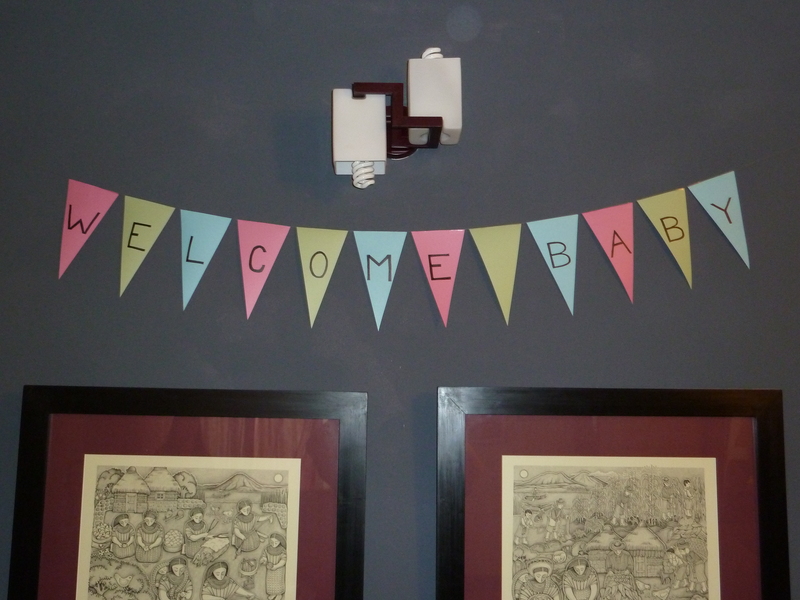 The banner flags also came together to make a Welcome Baby sign. A friend loaned me some old pink saris, and they made a great window covering, to block the view of our neighbor’s laundry lines, and hide the embassy’s bland beige curtains, but still let some light in. The flowers came from a wedding flower vendor, and are as glitzy as possible. They also had a weird gasoline smell, so I burned a candle in the dining room the day before to cover/eliminate it. I covered the table with a queen sized bed spread that I’d found at the handicrafts store (table cloths are almost all white here, and often embroidered, but not in a fun way, only in a formal holiday dinner way. There are also block printed cloths, but not in the diplomatic zone, you have to go to New Market for those). I cut out circles from metallic wrapping paper to drop on the tablecloth and match the sparkley flowers. If you really want to glam things up, the wedding shops on Elephant Road have everything crazy-glittery that you could ever want. A friend decorated the cupcakes for the party, and made them blue at the 11th hour when we’d heard of the gender change. Luckily, our commissary-purchased dishes and cups were blue, rather than the typical Solo-red, since we were trying to choose something that would look nice with the other colors. (Thanks Mr. A!). The punch just happened to be blue already as well, as was the punch-stand and the scarf that I used as a buffet cover. 1. 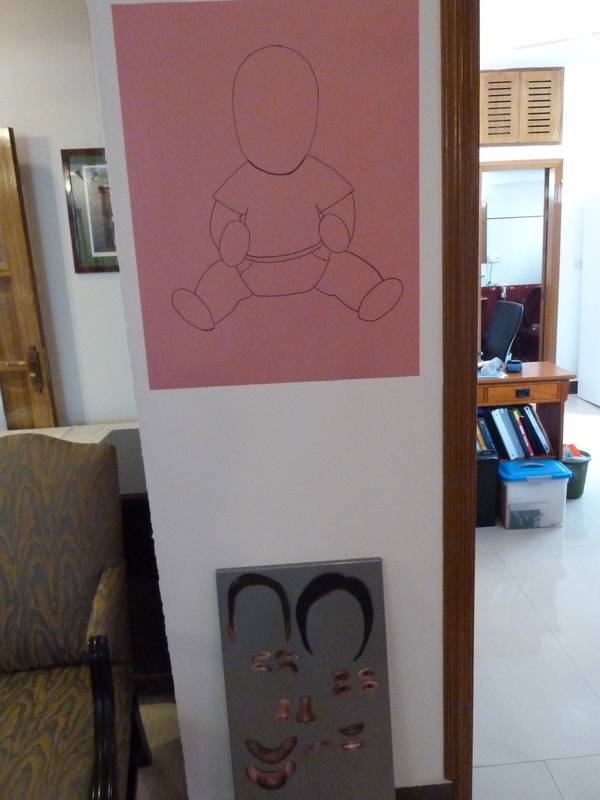 Pin the face on the baby, in which blindfolded party-goers stuck cut outs of the to-be-parents’ facial features onto a drawing of a baby. The result was somewhat Frankenstein-esque, but the game was fun. 2. Mad-libs, in which everyone filled out a card that had a mad-lib word description on it (i.e. “famous person’ name”). I read the completed story aloud, filling in the blanks with the words people had written down. I wrote the story myself, since I couldn’t find an appropriate one online. All in all, the event went really well. 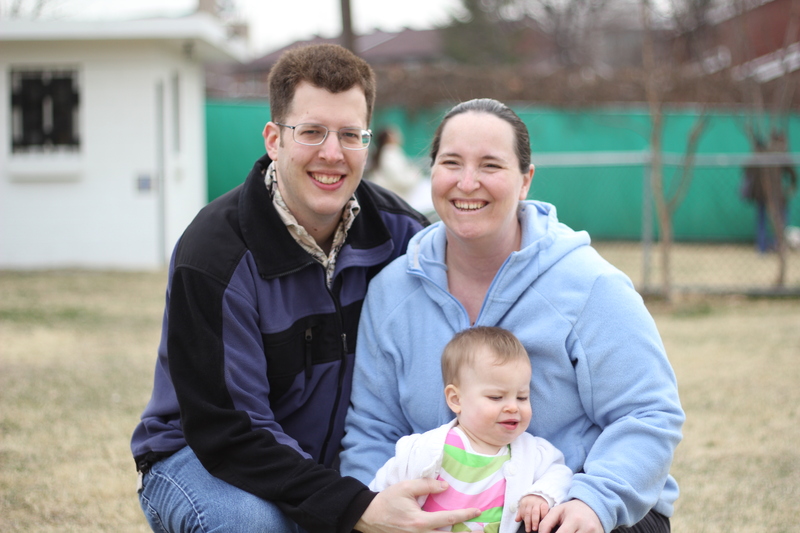 I was surprised how grateful the to-be-parents were, and how smoothly it all came together. Our main room isn’t really meant for 30+ people, but we managed to squeeze in comfortably. 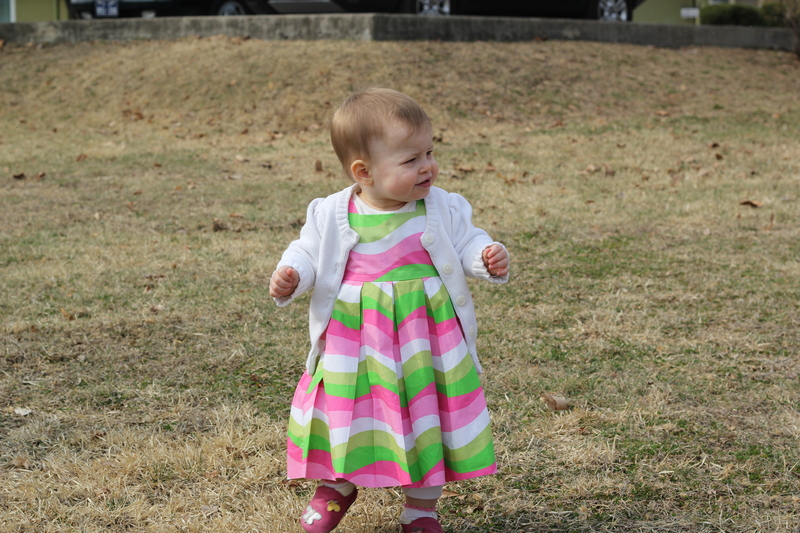 Here’s a cute shot of Neko all dressed up and ready to head out to the Easter Vigil mass. We went to mass at the Vatican delegation. It’s a great big imposing building, but always seemed rather empty from the outside. It’s really close to the American Embassy, so I pass it everyday, but this was our first time inside. The nuncio and his secretary, a monsignor, were both very hospitable, and hosted a potluck on their formal china afterwards. The attendees were varied, and included both high and low brow folks, but a pretty small group. Still, we filled the little chapel and had to squeeze in a few extra chairs. It was a homey little service and reminded me of my time in Boston, both architecturally and spiritually. Occasionally in Dhaka there will be a public strike (hartal) which affects most industries and political sectors, or some other kind of mass political event, which leads to the Americans being “confined to the diplomatic enclave.” The borders of the enclave are defined by the government of Bangladesh, and so… sad as we are that Cream and Fudge (one of the few ice cream options nearby) is outside the area (as is North End, the coffee and cinnamon roll heaven), we cannot venture there on such days. 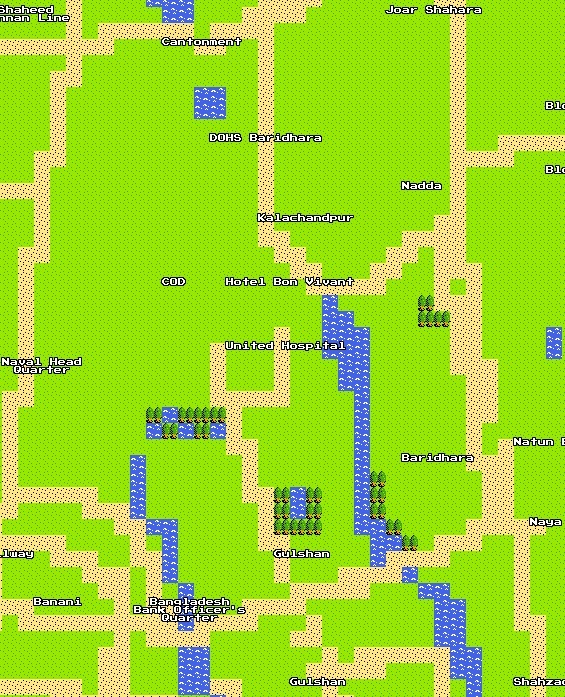 However, thanks to the engineers at Google, we can now pursue other adventures in our 8-bit enclave… saving princesses, recovering the Tri-force, locating the black cauldron, etc. If you need a MAP to guide you in your quest, put this one in your LEATHER BAG. It’s been a long time again, working appears to take a toll on my desire to blog. Most of the time, it takes a toll even on my desire to eat dinner (or, rather, cook it). I’m spending most of my day in front of a computer screen, so the one at home just doesn’t have the appeal. In the interim, we’ve been to Alaska and back, we’ve gotten the news of where we’ll be posted next, and we’ve seen the baby yawn on an ultrasound. Exciting times. The first two deserve their own post, so you’ll get those separately, though probably all at the same time, since I’m writing these out before I upload them. 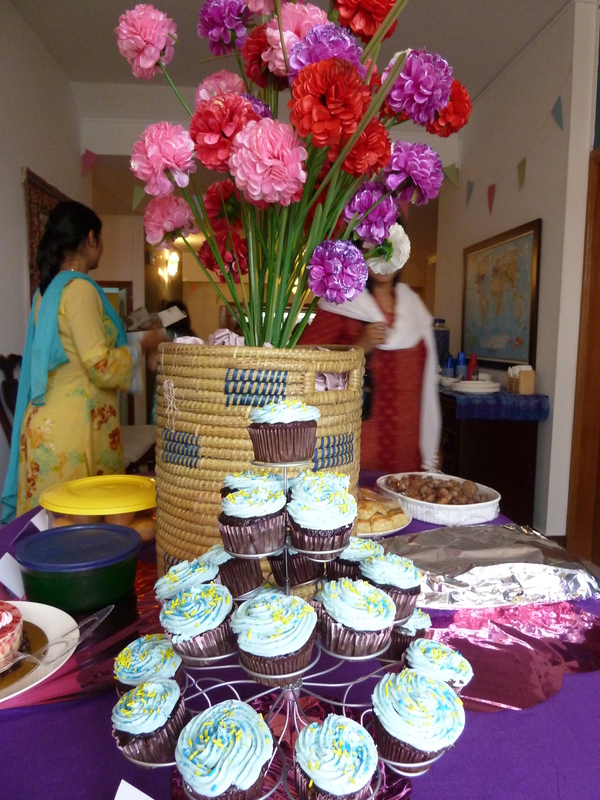 Last night was the monthly tea at the Deputy Chief of Mission’s house. Lest you think a “tea” has to be a dull and stuffy affair, like I did when I came, all nervous to the first one this time last year, I want to set you straight. While there is tea at the DCM’s tea, and while there are some cookies (everyone raves about the chocolate chip ones), there is also an ample supply of wine and mixed drinks, a variety of hors d’ouvres, including: fish sticks, meatballs, tiny samosas (which are different than the Indian ones, but more like a triangular fried egg roll), mini pizzas, bacon-wrapped something-or-other, veggies, oatmeal bars, flan, stuffed mushroom caps……. It’s a smorgasbord. Except for one detail. I was advised this week to eat less fat, so the potential eating extravaganza was sadly limited. I did sneak in a cookie though, you’d hate to pass up that monthly treat. It also, strangely, turned out to be a night of matchy-matchiness. A significant number of us all arrived wearing black and teal. So, of course, we had to take a photo. You can see the evidence on my FB page. We rocked that color. Dhaka’s a two-R&R post for 2-year tours. That means the government rates the conditions in the city strange and/or difficult enough to warrant two trips to some other place for a little sanity restoration. (Those of us who are here realize that 2 vacations isn’t really quite enough, and, on average, take an out-of-country trip at least every other month. Our rate is slightly lower than that, but close.) There are regulations in place at each R&R designated post about when you can take the trip. Here in Dhaka, you have to wait a certain amount of time after arriving (and vice versa on the other end), as well as have a certain number of months between each trip. You, of course, like any vacation time, have to coordinate with your coworkers and supervisors for coverage. The R&R “perk” is that the government doesn’t just tell you to git outta Dodge, but also pays for your ticket out. You use your own vacation time, so we try to schedule R&R travel to coincide with trainings or long weekends to maximize the time. We’re about 10 months into our tour here in Dhaka, and one of the last of our group to take our first R&R. It’s possibly the sweeter for being so long delayed, however, and we’re really looking forward to the chance of being a bit chilly for the first time in a long time. We even went through our winter clothes, wondering if we needed to pack the wool socks. Why? We’re going to Alaska, and we hear they have glaciers and grizzlies there. They apparently also have McDonalds and other American excitements, possibly even movie theaters and sidewalks!